I’m part of the Amazon affiliate program and may receive a commission for items purchased from this post. 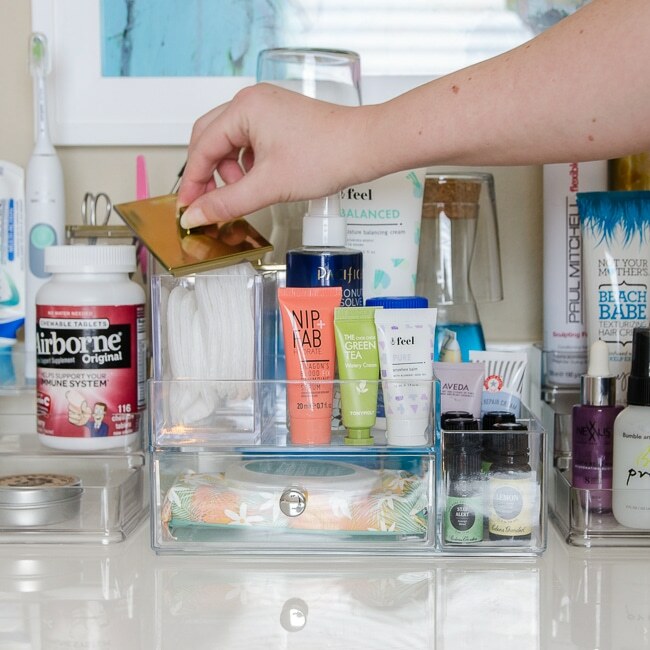 Organizing makeup, hair products, and other beauty products is easier than you may think. I’ll show you how I got mine under control and set myself up to create successful new morning and evening routines. It’s been over 5 years now that I’ve laid in bed at night telling myself I REALLY need to standardize a morning and before bed routine. There have been studies proving them effective, in large part because when you do positive things on auto-pilot, you’re not wasting decision-making energy. Plus, being disciplined is contagious. The small acts in the morning can lead to better eating, exercise, and work decisions the rest of the day. Before I can figure out my exact new year routine, I’m setting myself up for success by starting from scratch re-organizing my makeup vanity, bathroom countertop, and bathtub surround. 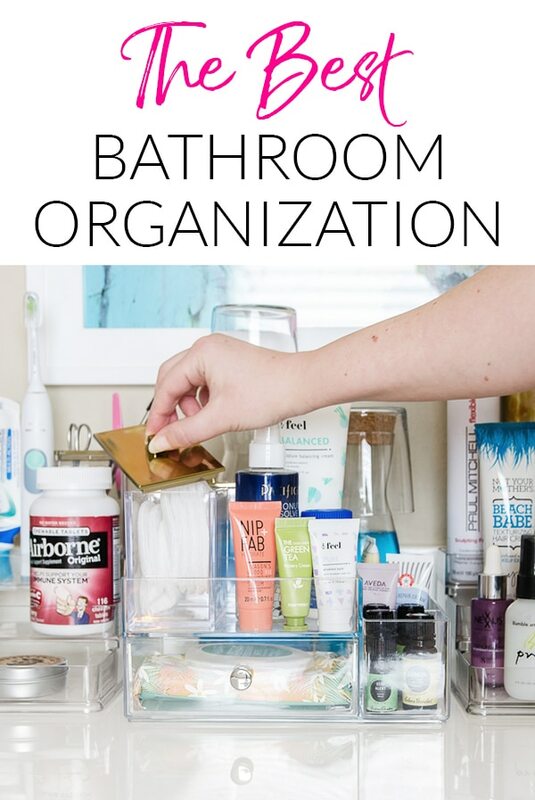 My friends at Interdesign were the perfect partners to sponsor this post so I could show you a variety of products that may be able to help solve your bathroom organizing dilemmas! Let’s start with the easiest fix – the bathtub. Last year, I made big progress making the tub surround more functional and pretty. After living with it awhile, there were a few things that I knew I could make even better. The basket I added for products, razors, etc did the job of hiding the clutter, but also became a jumbled mess inside. I hadn’t followed my own rule of sub-dividing storage areas that are too large. I switched to a Bath Caddy and now I can actually SEE what I have! I picked a soft gray in the small tote style, but it comes in lots of cute colors a few sizes. It fits perfectly in the corner of the garden tub! There is a handle in the middle so you also have the option of storing it in a closet or under the sink and then bringing it out for bathtime. Since the caddy takes up less space than the old basket, I also added a cute soap dish! On the other side of the tub, the container I was using for Epsom salts looked good in theory, but had 2 issues. The biggest was that the opening was a bit small for scooping unless it was over half full. That meant salts were constantly spilled. I found two small medicine boxes that are perfect because the full lid flips open. After adding some vinyl labels with my Silhouette machine, I was in business! I was excited to realize that these containers actually hold more than the less efficient old canister. Across from the tub, our vanity seemed to be getting more dysfunctional by the day. Since I wanted to have better morning and evening routines for the new year, something had to change. Here’s what I started with. Not only is it a mess, the style doesn’t really look like it’s in our house. I went radical and decided to get everything we use regularly out from behind doors and drawers and into the open. 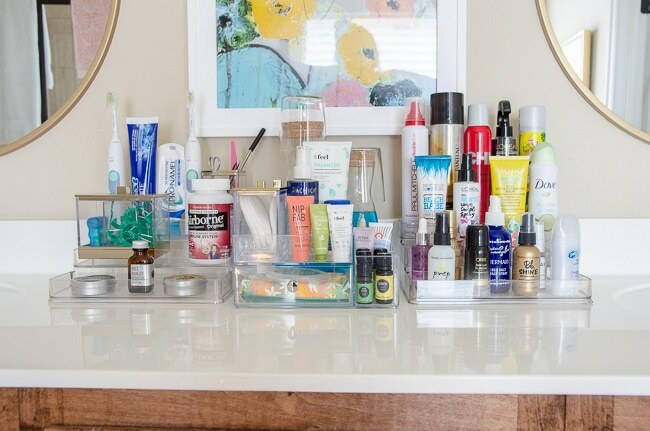 I had planned on using just one tiered stand on the counter, but once I started filling it, I quickly realized I wanted to move the one I had been using under my sink for hair products up to the counter as well. In between the tiered stands, I added another organizer with a drawer and divided area for smaller items. Using additional canisters on top of the larger organizers gives me a perfect space for everything. That decision to put everything in plain view led to a decor swap that I’ve been putting off for YEARS. Our old bathroom mirrors were pretty but had a heavy dark frame. They didn’t match the feel of the updated attached master bedroom or closet. I’ve had my eye on round gold frame mirrors at Target for at least 2 years but kept putting off the purchase. 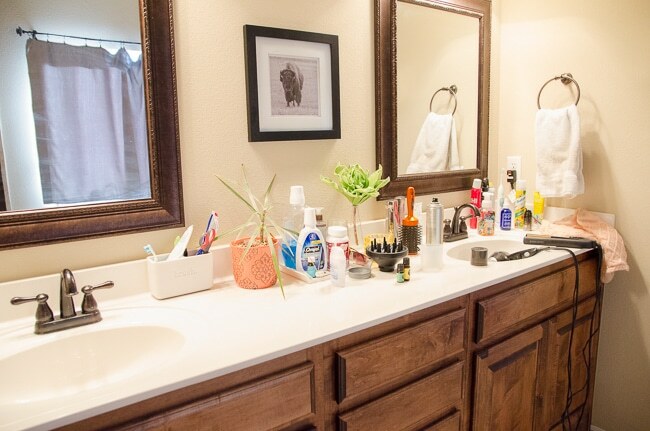 With the additional products on the bathroom countertop being function, but looking a bit busy, it was the perfect time to simplify the mirrors. Once those were hung, I had enough space to swap out a painting from the closet. I LOVE it and in this location, I’ll be able to appreciate it even more! While I was changing things, I opted to swap our plastic foaming disposable soap dispensers out for refillable glass versions. We’ve had the same style in the kitchen for several months now and it’s so nice that they don’t tip over during use when you get toward the end of the bottle! Did you notice those sweet new rugs? I love that the round versions mimic the mirrors and the rectangle versions mimic the design of our geometric bedroom wall. It’s nice to FINALLY have the rooms tied together! The new organization and decor makes me smile every time I walk through the bathroom! Here’s the list of everything I used all in one spot. Just click them to go straight to Amazon for details. 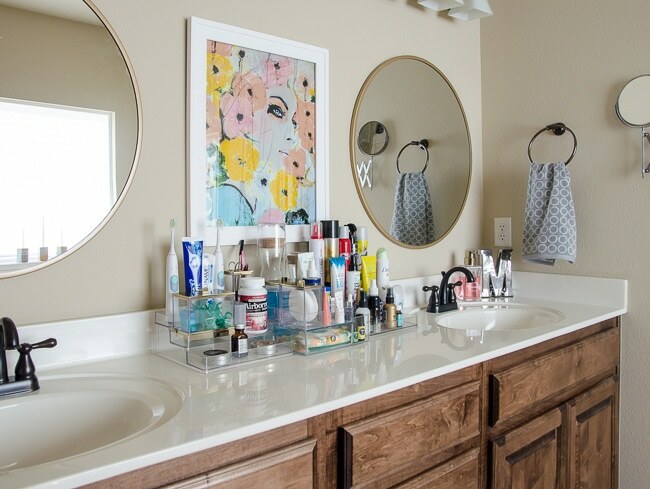 Next on my list is the makeup and jewelry organization – both items have gotten out of the control in the years since we added the vanity to the master closet. I’ll show you how I tamed the disaster next week! Thanks again to my friends at Interdesign for helping me with this post! « The First Step to Decorating – Do You Skip It? What would you do if you had a regular (less than 4 inch wide) tub surround? 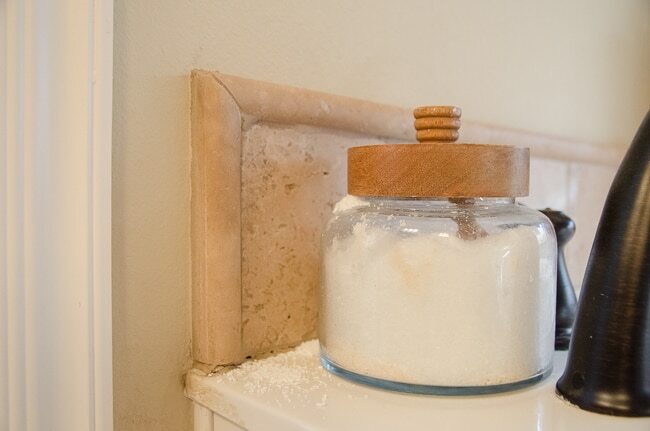 What about a counter by the sink with room for an electric toothbrush on one side and liquid soap on the other? Where do all your products go in a bathroom like that? I’m not being difficult — I love your solution for a big bathroom, but I really need help with my tiny rental space! Thanks! I totally understand the struggle! This is the first bathroom we’ve had with room to spread out, our prior homes had teeny bathrooms. One thing I wish I would have done in those situations would be using a tiered cart for bathroom products that could have lived right outside the bathroom door. Something inexpensive like the IKEA Raskog would work really well ( http://www.ikea.com/us/en/catalog/products/90333976/ ), or you could look at tiered bar carts for a different look. In our first house, the master bath was only a 1/2 with a pedestal sink. For that scenario, I should have fit at least a small desk into the bedroom with a mirror above it to use as a vanity. Life would have been so much easier in the morning! I would also use the back of your bathroom door for storage. Over the door shoe holders are also a great way to add storage for beauty products and rental-friendly. Maybe something like this: http://amzn.to/2BvooAp Does that help? @Susan, I saw a solution that might interest you, just last week. The apartment bathroom was tiny and off a little hallway. They lined the hallway wall opposite the bathroom door with some narrow shelves, stacked. 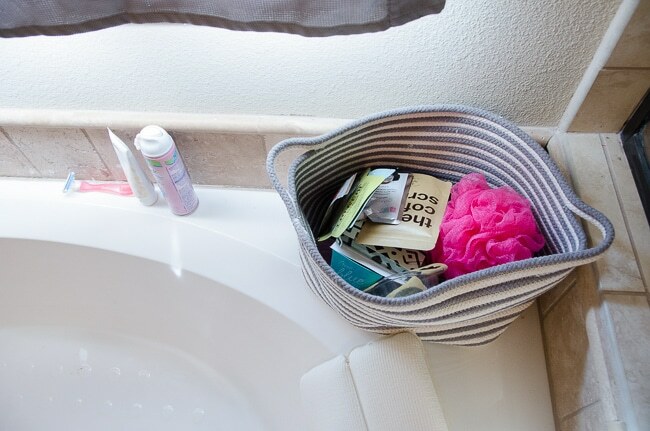 Accessories like hair dryers were in baskets, and you could grab a basket and take it into the bathroom with you. The shelves did narrow the hallway but since the doorway was opposite, that made it seem a bit more open. Sounds like there’s not really landing space in your bathroom for the basket. Maybe on the back of the toilet? Or maybe you could hang some of those cubbies or decor-type shelves to set diff baskets upon when you’re in there? Or a wall-mounted fold-up or fold-down shelf? Or a hook on the baskets? If I were in that situation again, instead of a grab-basket, I might go full time with my travel type tote that unzips with a hanger on top (mine is LLBean, had it for decades), and then to install one or more hooks on the back of the bathroom door. Hang it up to use, and then return it to its home in the hallway or nearby. Command Hooks? Do they make any strong enough to hold a tote or travel bag? Oh yes! The jumbo utility hook holds up to 7.5 pounds! Hey Susan, I’m in the same (very small, rental) bathroom boat. My first answer to almost anything is command hooks. It’s turning out that my second answer is tension rods. The plain ones are inexpensive and you can hang one parallel to the shower curtain rod, but on the wall side IN the shower and use it to hang bins with shampoos, razors, s-hooks for washcloths and bath poufs. 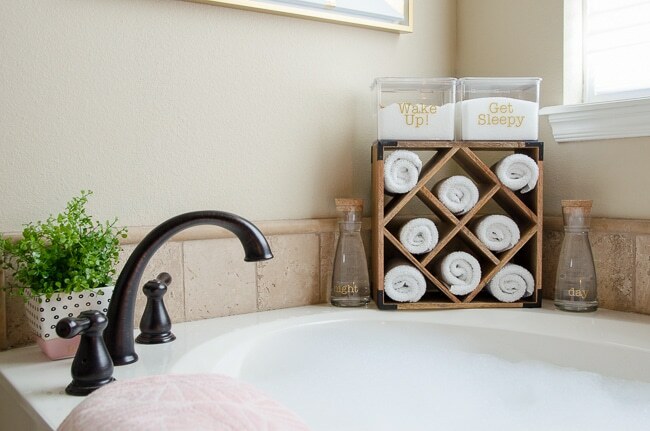 You can also hang one right next to the shower curtain rod OUTSIDE of the shower and put pretty baskets and bins on it for decorative and useful storage. Thank you for your prompt and very helpful response! Since there’s no room for most of these in my current place) (a cart in this hallway, a desk in this bedroom — no way), I’ll just have to simplify — or move! But I will use these in whatever place I go next — and you’ve gained a follower for life by your clever solutions and your courtesy. Thanks so much! I also saw a product I’d never seen before. (Can you tell I’ve been looking at bathroom storage solutions lately? ) Might work for a small bathroom. It was a shower curtain liner with pockets on the shower side. Oh I forgot about those! I saw them a few months ago and thought they were genius! 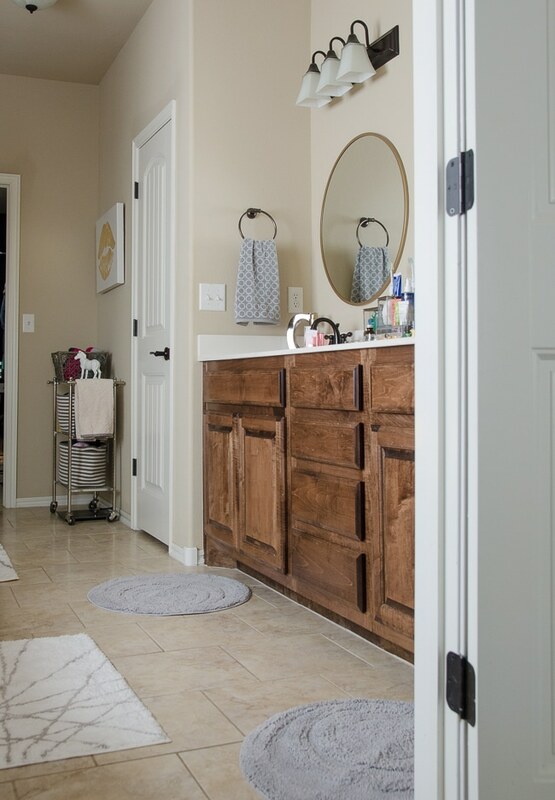 I need to work up a whole small bathroom storage post with all these great ideas. One more thing: can you please give a source for the bath cart (the wheeled cart with baskets on it) — it’s so sleek and modern, and small enough it would work anywhere. Thanks yet again! Of course! It came from Pier 1 last year! World Market also has a good one in a similar size (it’s gold vs silver though). The baskets do help it look unified! I need to mention this in another post, but we’re using those baskets for clothes that aren’t quite dirty, but not quite clean now. Like the ones that we both always leave cluttering up the counter – usually the comfy lounging around clothes we just wear in the house. I’m hoping having a spot for them will help keep them off the counter, which will keep me more motivated to keep everything else tidy. Fingers crossed! My curling iron or flat iron is usually in one of the sinks, too. I’m amazed that I have so so much stuff in the bathroom. It’s kind of ridiculous. I have the same size vanity as you and it’s full of stuff. I cleaned out 1 side recently and threw a few things away. But, most of it I might use at some point, so I don’t want to throw it away, so I guess I’m just frustrated that we need so much stuff. I want to be a minimalist! Totally understand! I go through phases of wanting to me minimalist too, but then I remember how much I enjoy all the things. 😂 But only the ones I really use or love. Yay! You brought the grey and pink in there — I knew it would work!! Beautiful! Yes! Finally added some in! So much better until we can make bigger changes. PS: So happy you’re back, I’ll email you tomorrow! After reading your article, I was motivated to clean out/organize one side under my sink that I hadn’t done, yet. Thanks for the inspiration. And I hear you say you can mix metals — but it takes skill or an eye I don’t have. Definitely! We’ve gone in circles about painting them MANY times and a greyish taupe would look nice. The walls need to be painted as well (both for color change and because the builder grade paint hasn’t held up well). 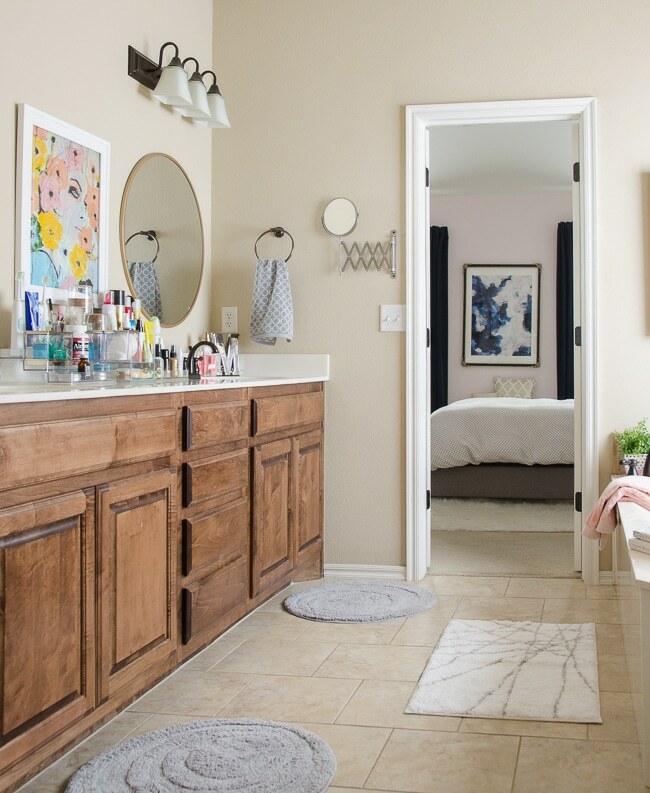 And I’ll love to do a pretty tile wall behind the mirrors…and change the light fixtures and plumbing fixtures, and tile. 🙂 See how fast I get out of control! And you give me so many great ideas – a lesson on mixing metals would be fun. It’s way less intimidating than it seems and I know you could do it with a few guidelines! Guidelines. My kind of word. And examples. I’ve been spending time online trying to find solutions, and I thought I was just dense for a long time — definitely am challenged without the background, experience, or training I would need in this area… but I have come to think it’s just silly that so many interior design articles use photographs that do NOT actually illustrate what they are discussing. Sorry; I am refraining from a rant! I love the clear storage ideas, and need one of those tiered ones for sure. Thanks for the tips. I didn’t notice any Rodan and Fields skin care products. I can help you out with those fine lines before they become wrinkles with a 60 day money back guarantee. Send me a message and I’ll hook you up! The tiered organizers are the best! I find uses for them all over the house! I love all the different types of containers/organizers you used! Where did you get the wooden storage crate for the cloths?? I LOVE it! Hi Stephanie, It’s a wine rack from Pier 1! Here’s a link to it: http://www.anrdoezrs.net/links/7633974/type/dlg/fragment/q%3Dwine%252520rack%26origin%3Dgridswatch/https://www.pier1.com/napa-cube-wine-rack/2975408.html (affiliate link). We’ve used it both in the kitchen for wine and now in the bathroom for wash clothes and love it for both!